Fall is almost here! 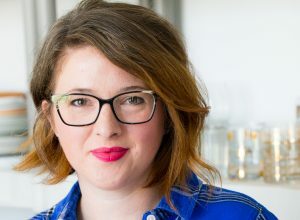 My absolute favorite season – filled with soups, cider and sweaters! I can’t wait. During this time of year I tend to make soup…compulsively. If it can be turned into a soup, I will make it. And because of this strange endearing habit, I go through a lot of chicken stock. I found myself buying can after can of stock and wondered if there might be a better way to feed my soup addiction. I had heard other home cooks talk about making stock but thought surely that is for people with too much time on their hands. 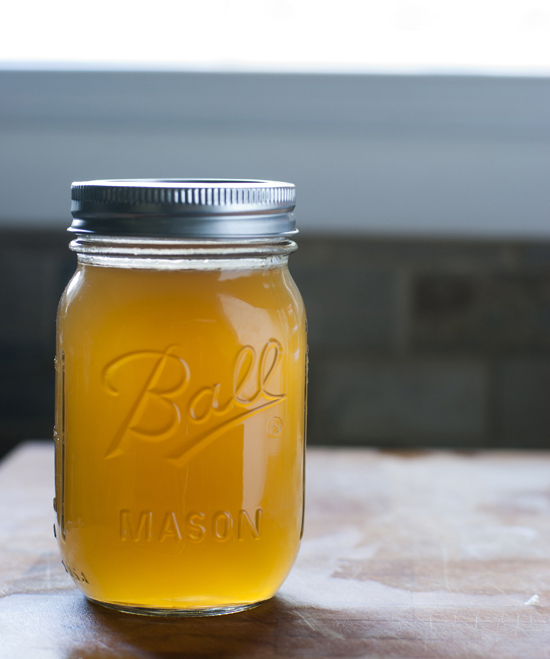 Turns out, making your own stock is simple, easy, and very gratifying. Yes, it takes a couple of hours – but hands off hours. If you are going to be home watching Friends reruns, simply through a batch of stock on to simmer and you will feel endlessly productive. Begin with veggies. Beyond an onion, whatever you have in your fridge will work. I like to use an onion (quartered with the skin on), a tomato, carrots, celery (not pictured because I didn’t realize I was out so I substituted green pepper), and a bunch of herbs. Whatever you have growing in your garden or you can find at the grocery store will work. I used basil, rosemary and thyme. Parsley is always a good one, as well. 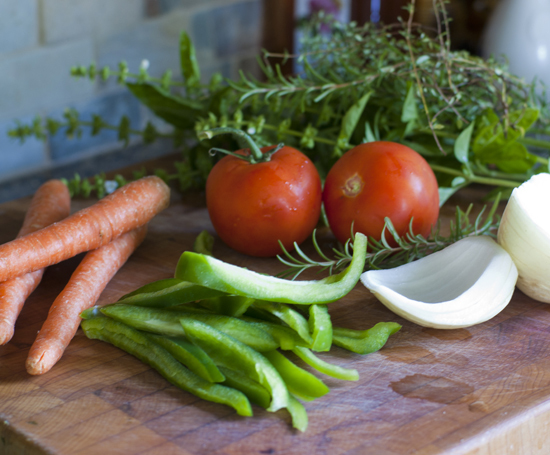 Place veggies and herbs into a stock pot along with your reserved chicken bones (from roasting your chicken breasts) and fill the pot up with water to cover your ingredients. Add peppercorns and salt to the pot and bring to boil over a high heat with the lid on, slanted. 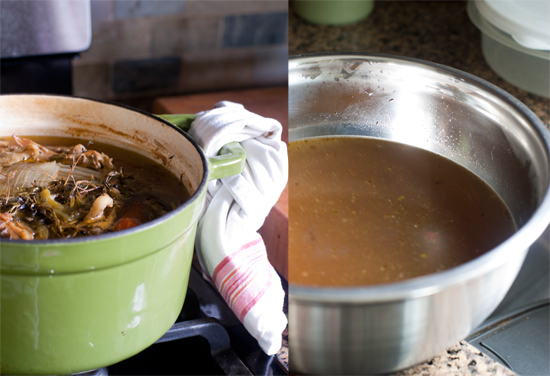 Reduce heat to a simmer and simmer for about 2 hours until desired color and flavor are achieved in your stock. Strain out solids from the pot. A paper towel lined mesh sieve works very well for getting all of the clingy bits out. No one wants clingy bits in their stock. Place bowl of stock in the fridge and allow the fat to rise to the top. This is a great help in skimming off any of the fat that has sneaked in. Feel free to leave a bit of fat if you like that sort of thing. “It’s just a vanilla milkshake, with chicken bits floating in it…” Sorry, I couldn’t help myself! Divide up your beautiful, rich stock into freezable containers and bags. Label and freeze for all of your future soupy needs! 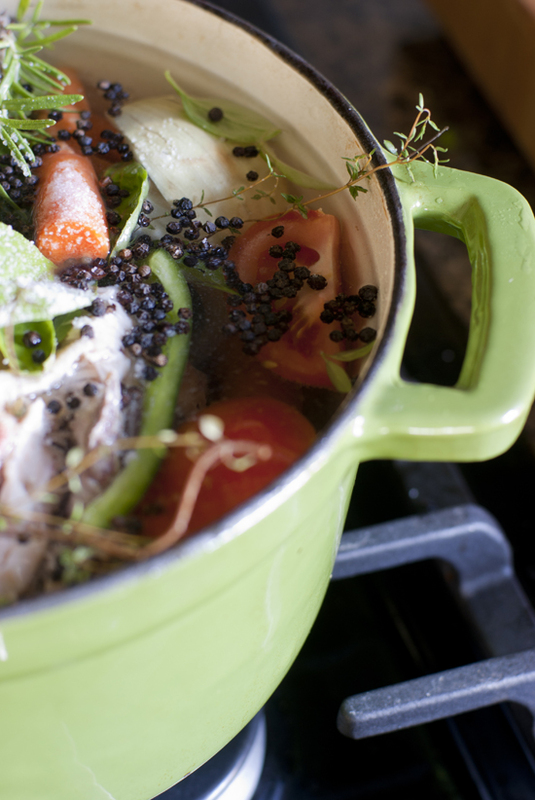 In a large stock pot, place chicken bones, vegetables, herbs. Fill stock pot with water to cover ingredients by an inch or two. Sprinkle in peppercorns and salt. Over high heat, bring to a boil with the lid on slanted. Reduce heat to a simmer and allow to simmer for about 2 hours, or until desired color and flavor are achieved. Adjust salt. Allow to cool slightly. Strain out all solids. A paper towel lined mesh sieve works well to get all bits and pieces out of your stock. 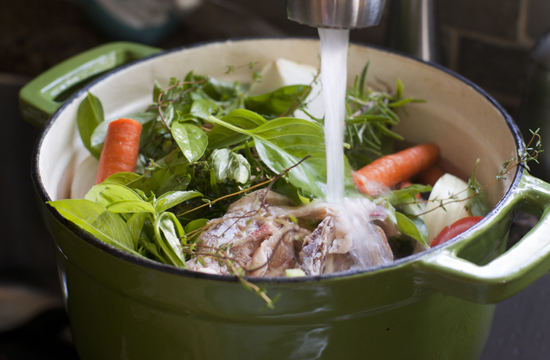 Place chicken stock (in a large bowl or container) into the refrigerator. This will allow the fat to rise to the top of the stock. Skim off fat. Divide finished stock into freezer safe containers or bags. Label and freeze for future use. 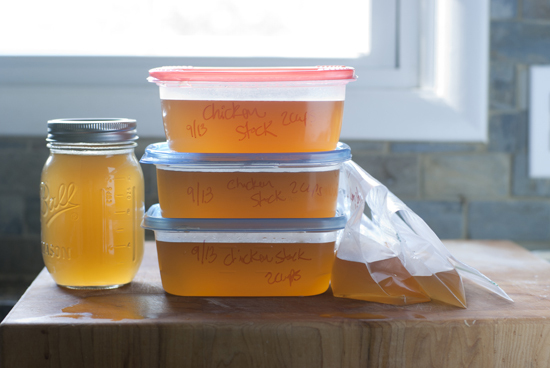 Simply thaw stock in the refrigerator over night before use. I loved the soup entree of a corporate catering we have booked last time. Do you make tutorials for soups, too? I’d like to share a tip or two. Thanks a lot!